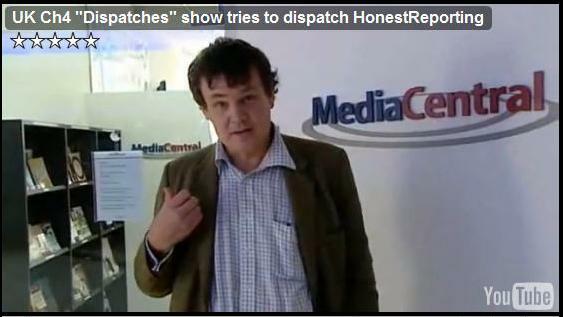 UK CHANNEL FOUR ‘DISPATCHES’ HATCHET ATTACK ON HONEST REPORTING EMBLEMATIC OF WHAT AILS BRITISH JOURNALISM……. – The Tundra Tabloids……. UK CHANNEL FOUR ‘DISPATCHES’ HATCHET ATTACK ON HONEST REPORTING EMBLEMATIC OF WHAT AILS BRITISH JOURNALISM……. How typical. This UK journalist could have taken the time and read Honest Reporting’s website in full, taken notes and enquire by email or phone as to any questions that might remain. But no, like in a scene from a silly Michael Moore documentary, the journalist tries to appear that he’s catching everyone off guard in a surprise show of video cams rolling and quick questioning. Honest Reporting has the full story here, and it bears reading in full, because it offers a birds eye view of how dishonest and factually challenged the British media is where Israel is concerned. Actually it’s quite amusingly absurd when you read what was alleged by Channel Four’s Peter Oborne, and then what actually is, once his claims are fact checked,….that are by the way, all available online. This was as blatant of an attempt at generating a news story from pure helium as it gets. Here in Finland, the state TV broadcast company, YLE, staged a similar stunt, in trying to invent a news story while the war in Lebanon was happening. YLE took a look behind the scenes at the (boringly legal) investment in Finnish businesses by Israeli investors. They were simply tryíng to test the market for any sentiments for boycott of Israeli goods, which fell flat, they didn’t find anyone interested in such a thing, except for a few fringe loons. On November 16, the UK Channel 4’s flagship documentary program, Dispatches, broadcast an investigation of “one of the most powerful and influential political lobbies in Britain, which is working in support of the interests of the State of Israel”, directly attacking and smearing HonestReporting in the process. “Despite wielding great influence among the highest realms of British politics and media, little is known about the individuals and groups which collectively are known as the pro-Israel lobby,” the program noted. Aside from inventing a non-existent “lobby” that conjures up images of some of the worst forms of anti-Jewish prejudice, the documentary attempts to discredit and delegitimize HonestReporting and the thousands of its subscribers who care about accurate reporting of Israel in the media. While the program had been in the making for several months, it was only in the few weeks prior to the transmission when those UK Jewish communal and pro-Israel organizations targeted by C4 were contacted by Hardcash Productions and political commentator Peter Oborne. Previous Post Previous Post SUPPORTERS FOR APOSTATE FROM ISLAM RIFQA BARY GATHER OUTSIDE COLUMBUS COURT HOUSE……. Next Post Next Post THE SWEDEN DEMOCRATS’ KENT EKEROTH DISCUSSES ISLAM…….